Hofdijk, J., Séroussi, B., Lovis, C., Ehrler, F., Sieverink, F., Ugon, A., Hercigonja-Szekeres, M.
The current trend in health and social care systems is a shift from care provision to citizen-driven health. Only a few years ago, the high-tech devices used in healthcare were limited to health cards and personal portable devices. These have since evolved dramatically to include wearables, sensors and devices for measuring health values. The application of such technologies has, for the most part been welcomed by both patients and professionals. It is the fact that these devices can be connected to and communicate with other connected devices and systems which has been the game changer in healthcare technology, not least because it has empowered and will empower patients to take more control of their own healthcare management. 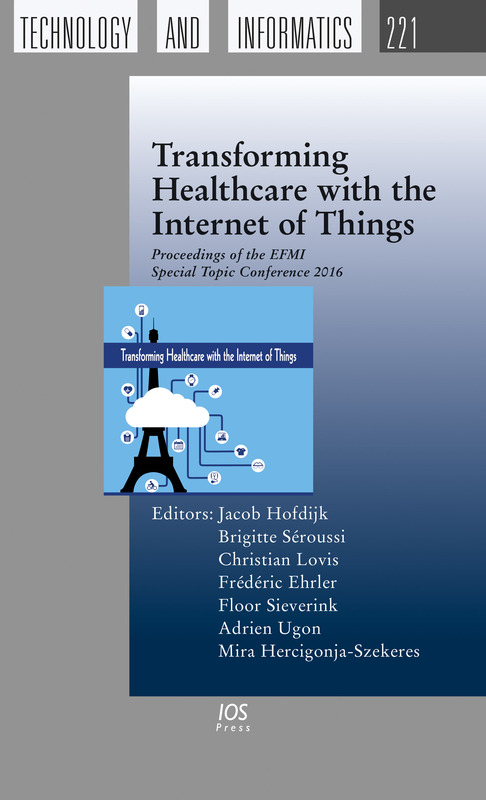 This book presents the proceedings of the Special Topic Conference (STC) of the European Federation for Medical Informatics (EFMI), held in Paris, France, in April 2016. The special topic this year is 'Transforming Healthcare with the Internet of Things'. The papers are divided into four sections: transforming healthcare with the Internet of things; societal dimensions of the Internet of things; ontology and decision support; and clinical information systems and data reuse; with a further section for poster presentations. The book will be of interest to all those involved in the provision and delivery of technology-based healthcare.